XPL-3200 polarizing microscope is utilized polarizing light to observe and research the matter which have double refraction features, enable to observe in single polarizing, orthogonal, conoscope. It can be applied in geology, chemicals, physic and leechdom fields, widely used to observe the crystal of liquid macromolecule polymer, biomedical polymer and liquid crystal. 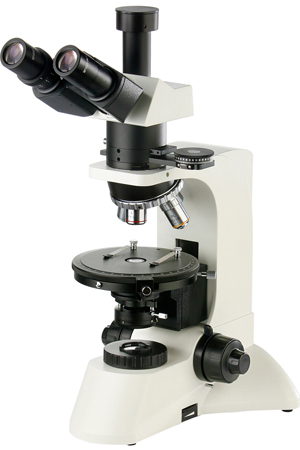 It is the ideal instrument for scientific research and universities teaching demo. Infinity with strain-free plan achromatic objectives, the field of view is widely and clear. Wide-field plan eyepieces: field number Ф22mm. Rotatable stage, 360° graduated in 1° increments, minimum retardation resolution 6' center adjustable and with tightener. Wide voltage range power supply (85-265V 50/60Hz), 6V30W halogen lamp, brightness adjustable. Trinocular can be observation for eyepieces and microphotography in 100% light flux, suits for low luminance microphotography. Rotatable stage, diameter |μ150mm, 360° graduated (in 1° increments), minimum vernier division is 6' , center adjustable and with tightener. Integrated analyzer, can be switched to normal or polarizing observe freely , enable 0~90° rotated and minimum vernier division is 12'. λ, λ/4 and quarts wedge compensator. Trinocular is inclined 30? and enable to shoot in 100% light flux.